These scents are traditionally used in Indian culture to evoke spirituality. Javadhu is a blended fragrance you can often smell wafting in Indian air. It is worn by both men and women to "freshen up", especially before a special occasion. The powder, made in to a paste, is also sometimes applied to temple and home deities. Its fragrance is captivating, and loved by many. It is also a fragrance that is believed to enhance spiritual practice. The powder can be used as a body deodorant as it contains sandalwood powder. 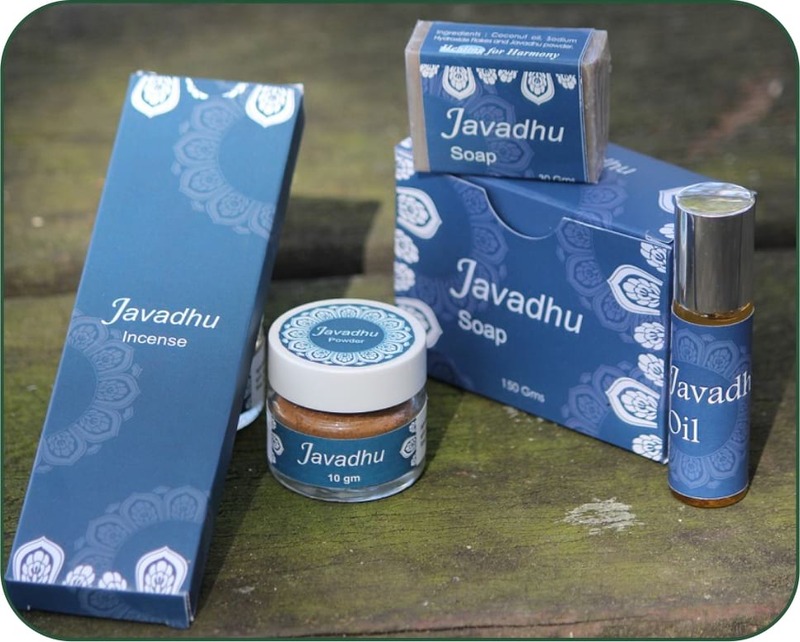 Javadhu contains Sandalwood, herb and spice extracts and rose and jasmine flowers. Javadhu soap contains Coconut oil, Sodium Hydroxide Flakes (Lye) and Javadhu powder only. 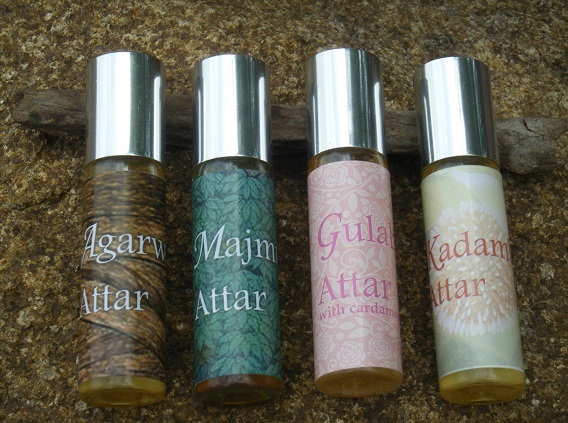 An Attar is a natural, fragrant oil that has been created by distilling either plant or flower petals by either steam or hydro-distillation, and distilled in to either a Vertivert or Sandalwood Base. Our Attars are natural and non-toxic, and suitable for people who have skin sensitivity to synthetic fragrance. Our Attars are in a 15ml metal roller glass bottle and are diluted 10% in sweet almond carrier oil. See below for description of each attar. Agarwood is a deep, dark, woody and earthy fragrance whose scent transforms to once it is warm on the skin. Long lasting, it is reputed to be calming on the nervous system and aid meditation. The use of Agarwood goes back centuries, throughout the Middle East and India. Agarwood's divine qualities are mentioned in Hindu, Muslim and Buddhist texts, and the Bible. This is an exotic and mysterious fragrance. It is floral and at the same time cooling, earthy, mossy and woody. Majmua reveals its complex layers over time. Majmua combines several attars; Mitti (baked earth). Vertivert, Kewda and Kadamb. Popular in the Middle East and Northern India, men and women put a dash on their clothing to freshen it. Gulab (Rose Attar) is a soft, feminine and nurturing scent enhanced by the evocative and warm fragrance of Cardamom essential oil. This attar is made from Damascus rose petals. This is an intoxicating scent, best described as "a lingering floral that has a hint of citrus." Once experienced, it is often not forgotten. This fragrance is mesmerizing and euphoric. The Kadamb Tree has divine associations and grows in some parts of India, and in other sub-tropical countries. The Hindu god, Krishna is reputed to have danced and played in a Kadamb forest, with his consort Radha and the gopis (milkmaids), and Goddess Durga is reputed to have had her earthly abode in a Kadamb forest. The Kadamb tree can be found near ancient temples in Northern India, its flowers used as offerings. The Kadamb flowers bloom in the summer and are at their peak when the monsoon rains begin. The flowers release their heady scent during the early hours of a summers day, between 3 a.m. and 6 a.m., a time that is considered auspicious for meditation.